Lewsiston Idaho, September, 1982. 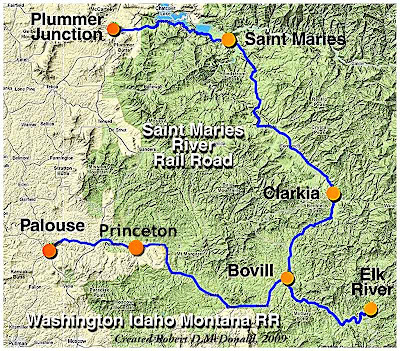 Several days ago, “Lost Rail” offered an essay entitled “Fade to Quiet,” recalling the Milwaukee Road’s Elk River Branch, known today as the Saint Maries River Railroad, located in western Idaho. 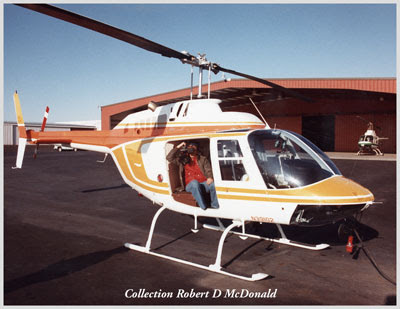 Reading “Fade to Quiet” evoked memories of long ago, when I spent the better part of a day flying in a helicopter over the stunning beauty of the St. Joe National Forest. 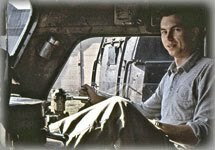 It was sensory overload for me, sitting in an open doorway of that chopper, bracing my video camera on my knee, eyes blurred by the wind, trying to hold steady on logging trucks moving deep in the dark green forest below. I was commissioned to produce a sales program on the Hale Hydraulic Retarder. That in itself nostalgic, as Hale Retarder had set up shop on Quimby Street in Portland, where Freightliner Trucks had their original assembly line back in the ‘50’s. It was an engine retarder for class 8 diesel trucks. When engaged, the diesel engine of the truck became a hydraulic pump. By forcing hydraulic fluid through an adjustable constriction operated by the driver in the cab, vehicle speed was arrested descending a grade. The idea was pure genius, invented by the Hale Brothers who were loggers down in Swisshome, Oregon. It did not require the complex engine modification like the Jacobs Brake. And, unlike the Jacobs Brake or Blue Ox exhaust brake, the Hale Retarder was absolutely dead quiet! The plan was to fly me up to the St. Joe National Forest where I would videotape logging trucks picking their way down steep forest service grades. At Clarkia (CLARK-ee) I would meet up with a driver who would take me up the mountain to get a load of logs. On our return down the mountain, I would videotape gauges installed in the cab to demonstrate the retarder in action. The timber industry was the engine that drove the economy of this area, rich in history. Formed in 1903, the Potlatch Lumber Company (from the Chinook word for" gift giving ceremony") built a 47 mile railroad from the interchange with the Northern Pacific Railroad at Palouse, Washington. 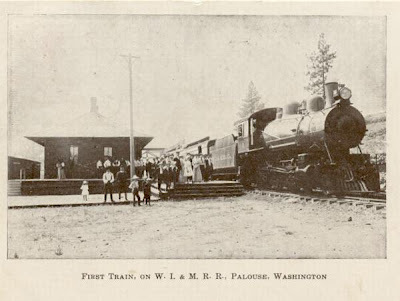 Named the Washington, Idaho & Montana Railroad, surveys began in 1905. The purpose of the line was to connect their successful mills at Potlatch, Princeton, Harvard, Deary, and Bovill, gaining access to thousands of acres of valuable White Pine forests. Despite its ambitious name, the line never made it past Bovill, Idaho, arriving there in 1907. In 1962, the railroad was sold to the Milwaukee Road. In 1980, sold to the Burlington Northern. Purchased from the BN in 1996, the line operates now as the Palouse River & Coulee City Railroad, terminating at Princeton. 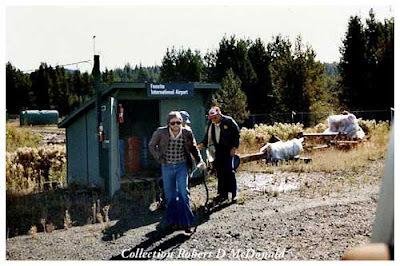 That portion of the line running from Harvard to Bovill was abandoned in 2000. To the north, the Milwaukee Road Elk River branch line, constructed between 1909 and 1910, started at the main line at Saint Maries, and ran 72 miles south through Clarkia, Bovill, terminating at Elk River. As with the WI & M, the purpose of the line was to tap rich timber country, crisscrossed with logging lines. 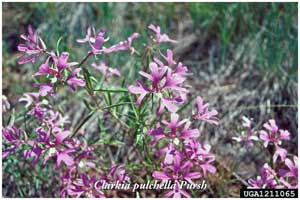 Clarkia (CLARK-ee) was named for a plant - clarkia pulchella – a tiny plant that so fascinated William Clark of the Lewis and Clark “Voyage of Discovery,” his 500 word description of the plant has become a minor classic! 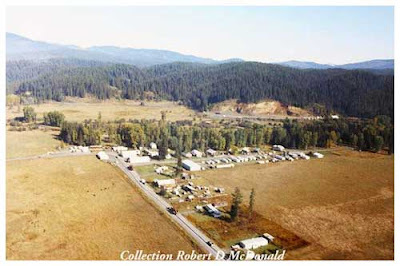 The Elk River branch line arrived in Bovill three years after the Washington, Idaho & Montana. When the Milwaukee Road expired, the line was sold to Potlatch Corporation (renamed in 1973) and named the Saint Maries River Railroad. The acquisition included the 18-mile stretch from Saint Maries west along the Milwaukee main line to Plummer Junction, an interchange with the Oregon Washington Navigation & Railroad, now Union Pacific. 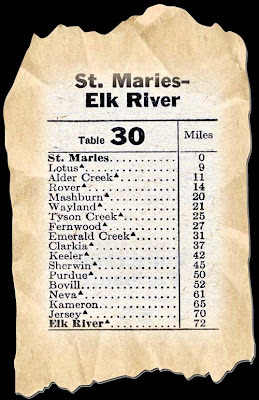 Milwaukee Road Time Table #30 from September 25, 1960 traces that 72-mile expedition into timber country. One hamlet on this line just north of Fernwood, - “Santa” – faced with declining timber demand, tiny Santa made national headlines back in 2005 with this clever marketing idea to shore up its waning economy! Having expended considerable fuel in a fruitless search for a grade known as “Telephone Booth Hill,” we made a fuel stop at Bovill, Idaho. In this view, looking west, the former Milwaukee Road’s Saint Maries to Elk River branch line enters at the bottom center of the photo. Bovill is in the distance. Log bunks are discernable on what I now know to be the Saint Maries River Railroad. 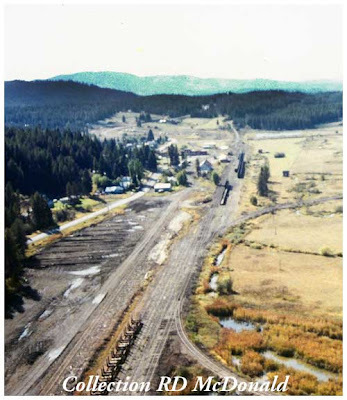 A line angling off at the lower right is a leg of a wye, which was the connection with Washington, Idaho, & Montana RR. The other line runs just a short distance to a log-loading stub. 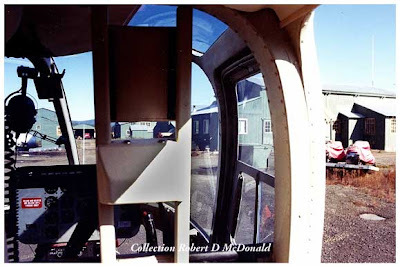 Hillcrest Helicopters had a fuel cache (“cash” not “ca-shay” as you often hear the word incorrectly articulated) at various locations, such as here at “Femrite International Airport” thereby extending their operating range from Lewiston. Notice the lack of TSA! Those were the days when flying was fun. This view was shot as we approached Clarkia from the west, just a short run - 15 miles from Bovill. You can see two logging trucks heading east on Popular Street into Clarkia. I was to meet “Jump Up John” He had the Hale Retarder installed on his Kenworth. The plan was for me to record the ease with which a fully loaded log truck could be restrained on a downgrade. Local legend explained that he earned the nickname “Jump Up John” because he could stand next to his Kenworth, and leap up onto the frame rails. 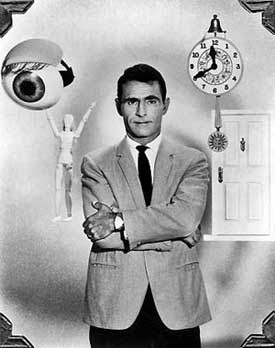 The meeting time was a little loose, what with the distances involved in a remote area long before the days of cell phones. Just after noon, the Bell Ranger I had rented set down in Clarkia, a genuine logging town with a railroad reload (the Saint Maries River Railroad) row of old wooden houses, and a general store. It was one of those marvelous general stores found only out in timber country miles from anywhere. Stocked everything from dynamite to pantyhose. It was the kind of store you can spend hours exploring. Creaky oiled floors, with that wonderful oiled wood floor smell. And in the back, a long thick marble counter with six or seven stools covered in yellowing white vinyl. An honest to god old-fashioned soda fountain. Gradually suspicions about me thawed, and the woman sitting near me with a big damn shot gun laying on the counter in front of her asked who I was meeting up with. Well, it was not as dramatic as all that. Turned out the lady was John’s wife. It was John’s shotgun. And he was to drop it off in Lewiston for repair. By and by my client drove up, and informed me that the video shoot would be scrubbed with “Jump Up John.” His Kenworth had experienced a dashboard fire causing him to miss his turn in rotation up to the loading site, about 40 miles round trip from where we were in Clarkia. But my client had a plan “B.” I would ride from Clarkia up the mountain with another log truck driver, video taping our descent down the mountain with a load of logs. Although he was not equipped with the Hale Retarder, the footage was invaluable to visualize the exceptional haul road conditions in the magnificent St. Joe National Forest. And I was giddy at the prospect of riding in a logging truck. Until I discovered there was no passenger seat. Just a big toolbox to sit on. But I really enjoyed the trip! A special “Thank You” to Dave Honan for graciously allowing me to feature one of his photographs taken on the Saint Maries River Railroad in September 2008. GP-9's 101 and 103 are reflected on the beautiful Saint Maries River. You can view Dave’s many interesting contributions on Railpictures.net.